I've seen people try to come up with a variety of classifications for this film, ranging from art-house to noir to "independent" (whatever that is) to low-budget horror. That's quite a spectrum and if I was the director I might find all those assessments rather flattering. They'd make me sound diverse. The truth is that 'Black Death' doesn't really fit into any of those categories but also, thankfully, doesn't fall between any stools either. It's simply a rather horrid story about rather horrid people doing rather horrid things in rather horrid times. The title tells you when and from this you can easily guess what the subject matter will include: plague, horrible death, witch-burning, religious extremism, unpleasant stabbings etc. Into this filthy period of vermin-ridden history we find a rotten band of bad guys tasked with hunting down what is perhaps a fearsome, Godless evil, though their doubts mirror ours and we soon see that not only is their task uncertain, so is the morality of, well, just about everyone, everywhere. It's not long before the body count starts to creep upward and we quickly realise that the only innocents in this film are those who died too soon to see or do anything. Everyone else is tarnished in some way or other. As I said, 'Black Death' isn't merely shlock-horror, although it could easily have been if the filmmakers had made some easy, lazy choices. Instead, this is very much a film driven by and about its characters and their broken ideas. Fundamentally, all that is terrible in its medieval world stems not from any of the hardships or suffering that its protagonists are subject to, but instead from how they rationalise these things, how they react and how they justify their behaviours. In truth, though all these people may think they're helpless in a wicked world, they are always ultimately the architects of their fate, or their misery. Thus, there's something of a Greek tragedy behind the unfoldings of a plot which never hesitates to be brutal, unromantic and unforgiving. The whole film is shot with unflinching handicam that follows the action everywhere, sometimes intimately, in order to dispel all illusion and destroy any and all ideals you might have been trying to gold. It seems that if you're looking for justice, resolution or redemption, you would need to be blind, as everything is uncovered and nothing is revealed to be sacred. I like 'Black Death' because it's original, it's deliberately trying to be different, it's uncompromising and it's not interested in satisfying you, only in telling you a story. I don't usually see any point in comparing films, as firstly that's folly and secondly no work is justified by it's similarity to something else, but in this case I think it's interesting to note that Black Death in some ways resembles 'The Thing' or 'Alien'. It's sort of horror, it's definitely about a group of disparate characters gradually being picked off in a fight against something that is both literal and metaphorical, its cast often can't even agree with or trust one other, because who knows what each of them is thinking or even carrying and, most of all, the greatest dangers are always ignorance or poor judgment. The biggest difference is who, or what, the bad guy in 'Black Death' might be and perhaps this makes the film more of an acquired taste. I think your enjoyment of this film may well hinge on what you want the answer to that question to be, or what answers you're willing to accept. 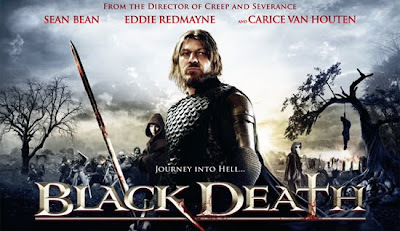 'Black Death' was released in UK cinemas in June 2010.